Today we are going to just put together a bunch of garden planter tips that we have come across over the years. Pick and choose the ones that fit your needs. We just hope you find some that are useful. Freestanding planters on stairs. Whether on the front porch or back patio, where ever you have stairs group your garden containers together, try mixing sizes, but keep the plant materials similar. When placed side by side all colors with intensify. Hanging wall planters are a natural way to decorate a bare wall on your patio or in the garden. Always end by filling the outside edge with trailing ivy. As it grows down out of the planter it adds texture and beauty. A tabletop planter doesn't have to be anything more than a clay pot bursting with colorful flowers to add so much to the whole conversation/eating area. Mix up the colors for interest. 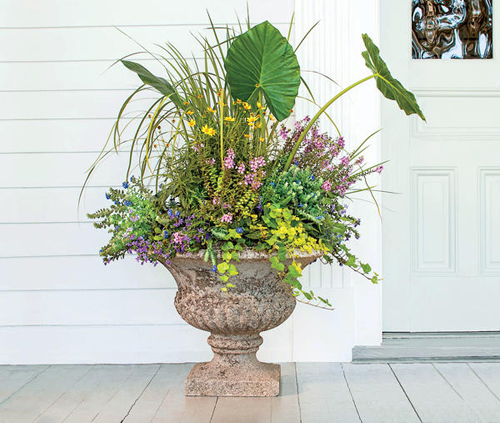 Entryway planters can be tall and stately spilling over with flowers or evergreens. We really like topiary here where they look like they are flanking your doorway for a class yet traditional look. Fireplace mantles can handle many different kinds of containers. A traditional window box is perfect because they are narrow and wide and can be filled with all kinds of plant materials. How about an outside fireplace? Don't leave them empty. Place decorative containers on each end for a finished look. 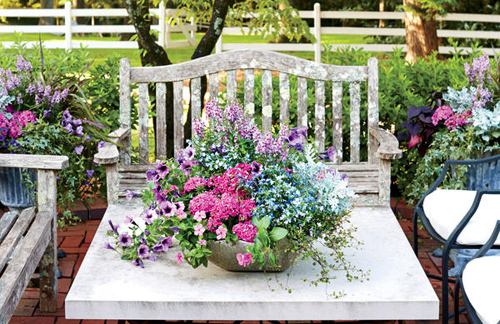 Garden urns come in many sizes. Small urns are perfect on a fireplace and larger urns flanking an entryway. But we love them tucked into a garden where they create a traditional English garden vibe. They can be displayed empty like a piece of garden art. 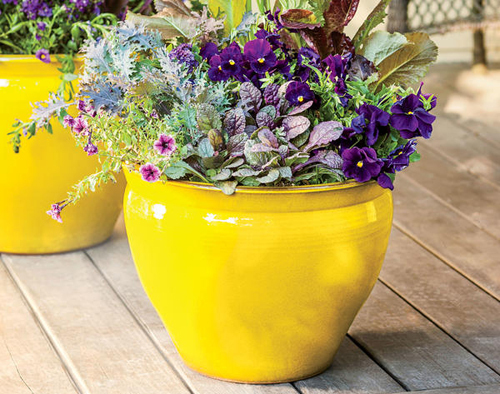 Color planters are best when you need a burst of brightness. Desert landscapes really need a colorful planter and plant materials. All green landscape can use a pop of color and mountain natural-scapes can use some colorful garden pottery to break up the repeatitive look. Read more..... Create this display in a garden planter.